Opossums are possibly the only known marsupials of North America. They have a not-so distant cousin to the possums of Australia. They have been known to infest homes and especially the attics and storage rooms. Their infestation in prized gardens can harm well-kept lawns, fruit trees, and succulent plants. However, attempting to control the situation by yourself can get overly confusing if you do not have any idea about the techniques and characteristics of the opossums. Here are 5 facts to help you better control their infestations and know when to call in animal control. An opossum is eight times more unlikely to carry rabies in comparison to wild dogs. Their natural immunity to the disease means you do not have to fear on that account. These animals are rarely feral. Opossums have a crazy natural resistance against the most deadly of poisons. They will be quite unharmed by the venoms as strong as that of pit vipers or rattlesnakes. This makes it even difficult to come up with a poisonous repellant for the marsupials. So, do not try to take matters in your own hands by trying to set poison traps for the opossums. Instead, call in professionals who have a better experience in techniques that really work against opossum infestations. Opossums eat rodents, snails, human food scraps, birds, fruits, and even grains. They have been tested to be quite intelligent in not only seeking out food but also remembering where it is stored the next time. This pattern makes opossum infestations most likely in gardens, storerooms, attics, and backyards with outside dining options. The infestation might also be quite likely in outside restaurant areas or family picnic grounds. 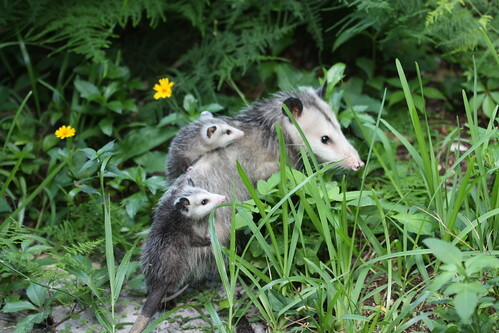 Opossums should pretty much be welcome in the garden because they eat snails and slugs and are a very natural way of pest control. However, for gardens with fruit trees or superior lawns, they are a total nuisance. Opossums have opposable thumbs (toes) on their back feet giving them an unnaturally high skill in climbing trees, so they can reach fruits on the tallest of trees with ease. It has a prehensile tail, which can be wrapped around the trees like an extra limb. They can even loop their tail around grass and bundles of food to carry them around. Opossums have large dilated pupils that give them superior nocturnal sight. Therefore, they are quite active during the dark. Approaching an opossum, you should be aware of their natural defense tactics. They would growl, or belch loudly. They might even urinate or defecate when attacked, so if you are contemplating chasing the marsupial while on your expensive carpet, think again! The most popular defense tactic is of course, they play “possum”. However, it is not a conscious decision. They go in to a catatonic state in fright and would roll over involuntarily with their eyes closed or open but glazed over. They would also be foaming around the mouth and start secreting a strongly malodorous liquid from their glands. It s their natural defense against predators who might consider eating the body. Attics, barns, pool houses, and general outbuilding structures are often the breeding grounds for bat infestations. Due to the hardy nature of the critters, any viable remedies to poison or kill them often fail. Here is a tragic plan to help get rid of this persistent problem in your homes. Home remedies such as moth repellants do not work as effectively for bats as you would hope. On the flip side, they are extremely poisonous for family members and pets in the house. Sonic transmitters or even playing loud music to scare away bats does not work because of common strategically problem. For this strategy to work effectively, you have to play the music or the sound emitters 24×7. So you would have to stop living anywhere near the transmitters and you would need to stay in a place where you neighbors do not have you thrown out due to extreme disturbance. You have to be able to understand the root of the problem, before devising any solution with a chance of working. 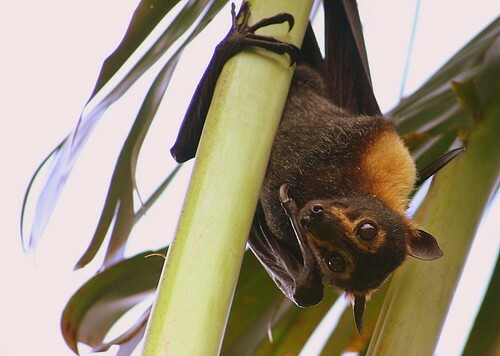 Bats have been known to be able to enter gaps as small as 3/8th of an inch. Pour over your outbuilding structures with a fine toothed comb. It also helps if you have a basic understanding of the behavior patterns and habits of the critters to correctly target problem areas. Bats are more likely to enter or exit at the highest gaps in the structure, for safety from predatory animals. Look for clues such as urine stains, bat odor, bat droppings, or bat nests to locate problem areas. You might be able to locate bats entering or exiting their entry points, if you inspect the house in the evening. Inspections in the day might reveal entry points but you would rarely see the bats or deduce the extent of the infestation without a proper night watch. Sealing the bat entry holes all around the building structure is the most effective strategy. Use square screen meshes as the sealing agents. Make sure to tape three sides of the mesh only so that bats already inside the house can go out during the dark but cannot come back in during the day. For pool houses, you can put in screened-in bat proof enclosures. Bats infestation around porch areas can be eliminated if you can get rid of the infestation within the outbuilding structure. Install a bat house at the main exit point during the sealing process. Professionals can take away the bat house after a week until which time all bats would have taken refuge in the bat house. Professional animal control representatives will not only have an experience in these kinds of problems, their trained eyes can spot problem areas and bat proofing techniques much more efficiently than any DIY project. Professionals like us will also help clean up the outbuilding structures of any bat droppings and odor residue. Here’s A Valuable Lesson On Wasps That You Should Not Miss! Donning on the iconic yellow and black jackets, one look and most people can identify them from a visible distance. They are not too be confused or related with ants or bees. Wasps have a specific target of pests that they feed on and they do not specifically target humans to sting; unless they are provoked by one, they may retaliate in numbers! They are also pretty territorial, so stay clear away from their homes, even if they have a makeshift one near your home! If you are curious and want to learn more about them, read on to find out the top 5 things you just got to know about them! Can a single sting be fatal? There are some individuals (usually a minority) who suffer an anaphylactic shock after being sting, and that may have fatal consequences. For a majority of individuals who were once sting by a wasp, it wears off within 24 hours and the venom from the wasp have no serious effect on them. It is very unusual that one dies from a wasp sting. The fact is amplified when a sting is compared to a lightning strike. The first thing you have to do is not to panic. If you were sting close to your home, calmly head back in and wash the affected area with soap and water to remove the venom. Wash it as much as possible. Proceed to ice the affected area to reduce the initial pain and swelling. Always remember to keep the wound dry to prevent an infection from taking place. After applying calamine lotion to soothe the discomfort, bandage it up to keep that area clean. If the pain is more than you can handle, you should consult a doctor immediately. Never stay in a single position and try to swat them off. They are already in a full-on attack mode, and doing the aforementioned will only make things worse. Instead, you are recommended to find somewhere safe to hide. If you are driving, stay inside and fully wind up the windows. If you are running into your home, make sure all possible entry points to reach you are blocked out. If necessary, jumping into water will also help to alleviate the situation, until help arrives. Their nests can be in a tree, underground or even within the walls of one’s home! Garbage and rotting food that are left unattended may also attract wasp. Food items such as sugary drinks with high sugar contents are an inviting source for wasp. Sugar prolongs their lifespan and enhances their reproduction functions. Keep away such items and make sure the area is clean before trouble arrives! Are they completely harmful to mankind and nature? Surprisingly, the answer is no! They actually do more good than harm (unless you provoked them). In farms, they help to protect the crops by killing off any pests such as caterpillars and pesky flies. Pests being part of their food source definitely aids farmers in their pest control efforts. If wasps start to cause more harm than good, affected individuals should not hesitate to seek help from pest control companies. A problematic situation needs to be solved before it spirals out of hand!